When using the ZBrush Project (ZPR) format, ZBrush can store almost all of your creative steps in its Undo History, allowing you to go further back into your sculpting history to fix any mistakes — even after reloading your project in a new ZBrush session! While there is a maximum number of undos which may be performed, this limit is set at 10,000 which in most cases will be far in excess of what you might need. For clarity, you might think of this simply as a process history. Note: This feature is only available with a ZBrush Project (ZPR format) file. It is not compatible with the .OBJ or .ZTL formats. Some actions within ZBrush will clear the undo history (see below). In addition to the expanded undo/redo ability provided by this feature, the Undo History can be used to replay your creation process and save it as a movie. For further details see: Undo History Movies. 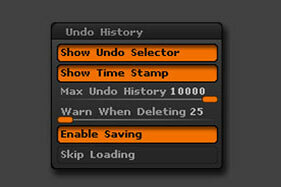 The Undo History can be turned on/off in any Project by toggling the Project > Undo History setting. It is important to keep in mind that in ZBrush, some operations are not undoable. An example of this when using one of the Merging SubTools functions. Be aware that when using such a feature, it will delete all of the project’s history up to that point. For this reason, ZBrush will warn you and ask for confirmation any time you ask it to perform an operation that will reset the history. Having this message means your Undo History will be lost beyond the current point. As with a traditional undo performing a new action will remove any latter steps. For example, if you have steps A, B and C you can undo back to step A. Doing something new at that point will create a new step B, preventing you from being able to redo to reach step C. Even “invisible” operation like storing a MorphTarget will delete the history that follows that point. The Undo History works in exactly the same way as a traditional undo. However, since it is awkward to press Ctrl+Z or the Undo button hundreds or thousands of times a slider has been added which will let you quickly scroll through your history. selector at the top of the document. It has small rectangles in light and dark grey, representing the History steps. You can easily navigate by clicking on any step. Or you may scrub through the History by draging the light grey rectangle. The Undo History selector, located at the top of the Document. The light grey rectangle represents the current step and can be dragged to navigate through the History. The Undo history controls are located in the Edit > Tool sub-palette. Notice that Undo History, when enabled, replaces the classic undo/redo commands. The Edit > Tool History sub-palette. The Del UH function, located in the Edit >> Tool sub-palette deletes the current Tool (or SubTool) History. Note: The undo history, depending of the number of undo’s saved, can increase the Project file size. If you don’t need your undo history, don’t forget to delete it every once in a while. Alternatively, turn off the Undo History button in the File palette. The Undo Counter slider, located in the Edit >> Tool sub-palette allows you to scroll and navigate through the current Tool history as an alternative to the Tool >> Undo and Tool >> Redo buttons. You can easily have a high number of undo’s to navigate through in your history. In the screenshot above, the counter is at step 1,337 out of a total of 3,420 undo’s. The Restore Placement mode, located in the Edit >> Tool sub-palette moves your camera to match where it was at the stored history point. This is useful for a history playback. This Store function, located in the Edit >> Tool sub-palette replaces the camera position stored in the current history position with the current position. This operation is useful when creating a movie using the history information and when a camera position must be replaced or modified. To manage ZBrush’s use of the Undo History feature, two preferences control loading or saving history for the loaded Project. The Undo History preferences, located in the Preferences palette. This mode, enabled by default, displays a small rectangle within the Undo History (displayed at the top of the document) each time a new History step is added. The light grey rectangle is the current step and the other darker ones are the previous or next steps. By dragging the light gray indicator for the current step, you can quickly scrub through the Undo History. Alternatively, clicking one of the darker rectangles will move you directly to that history step. This option toggles display of the time stamp as a popup on the Undo Selector bar. This slider defines the maximum number History Undo steps that you want to keep available. If you don’t wish to store your Undo History for animation purposes, you can reduce this value to minimize the impact of the Undo History storage space in your Project files. This slider defines the number of Undo History steps that ZBrush will automatically delete without warning for confirmation. For example, you can move back 10 steps in your Undo History and make a change that would cause the following History steps to be lost. If this slider is set to 20, ZBrush will simply accept the change and delete the following History steps. But if this slider was set to 5, ZBrush would ask for confirmation before allowing the change to be made. The purpose of this option is to prevent you from accidentally deleting your history while navigating through it. When you are working on your model you will typically want to leave this setting at a high value so that you can freely move within the history and start over from any point. But if you are setting up an Undo History movie you will want to reduce this value so that you don’t accidentally lose your work while preparing the movie for recording! The Enable Saving mode, located in the Preferences >> Undo History sub-palette saves your History when saving your Project. Disabling this button will deactivate any undo history. You will not have access to the Undo History feature, but you will also have a smaller file size. The Skip Loading mode will load ZPR files, but not any History saved within them.